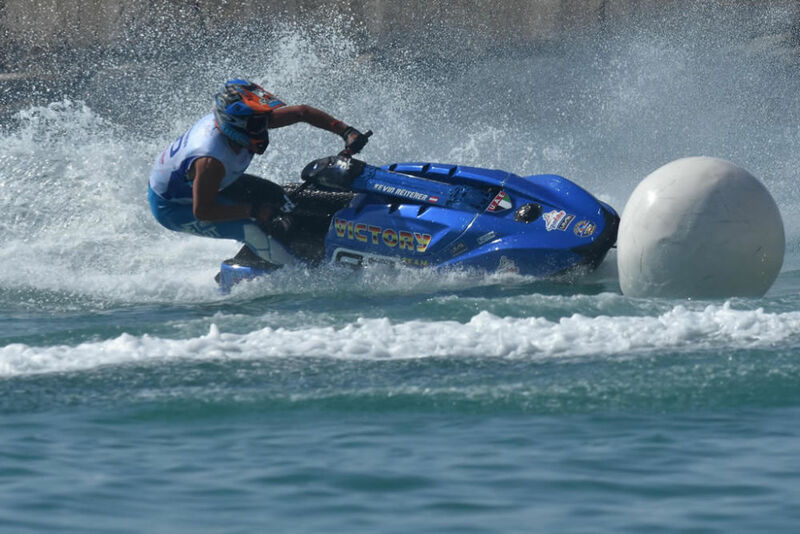 Hungary’s Gyorgy Kasza produced a brilliant performance to take just his second Moto win in the UIM-ABP Aquabike World Championship with victory in Runabout GP1 in the first Moto of the season at the UIM-ABP Grand Prix of Italy. It was a chaotic opening few laps with the conditions playing havoc with the riders qualifying slots, none of the top five holding their positions, Kasza making up seven places and out front at the end of lap one from Italy’s Mattia Fracasso – his race ending three laps later – and Christophe Agostinho. Pole sitter and defending champion Yousef Al Abdulrazzaq had a torrid opening lap, struggling to see the first turn mark due the glare of the sun and his engine cutting out when he went into the alternate track for the first time hit a big wave and his ignition key came out, dropping him to fifth. Marcus Jorgensen and James Bushell both had poor starts from P2 and P3 dropping to seventh and ninth on the opening lap, Jorgensen’s race ending a lap later, Bushell coming home seven laps down in 17th place. By mid-race Abdulrazzaq was back up into second place and on a charge taking 24 seconds out of the leader but running out of laps. 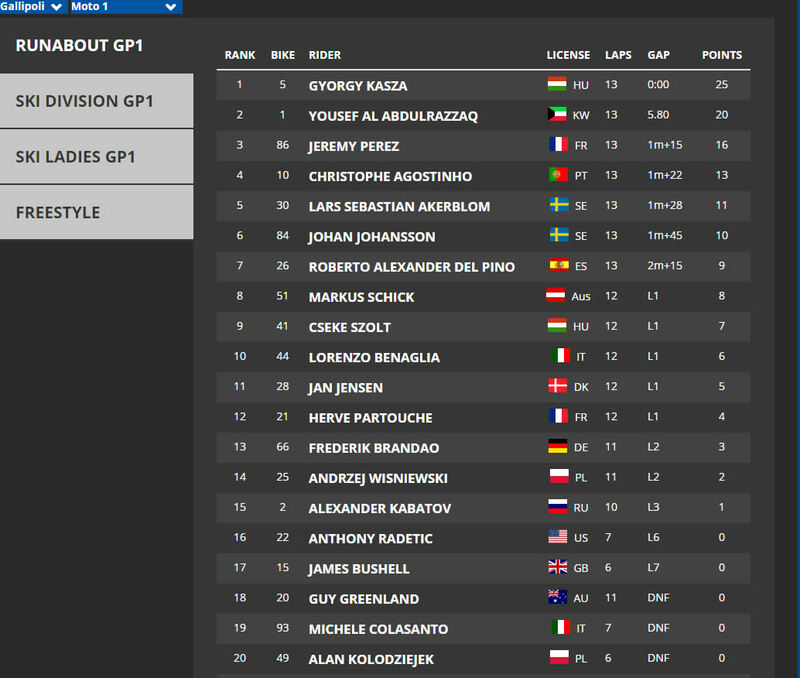 Agostinho looked to have third place sewn up but Jeremy Perez had other ideas, first trading places with Roberto Alexander and moving into fourth on lap 8 then chasing down and passing Agostinho on lap 12 to seal third place. Sweden’s Lars Akerblom fighting his way up from 11th to finish fifth ahead of countryman Johan Johansson. Aussie Guy Greenland blew an engine on the last lap so unfortunately a DNF in moto 1 for the #20 Queenslander. 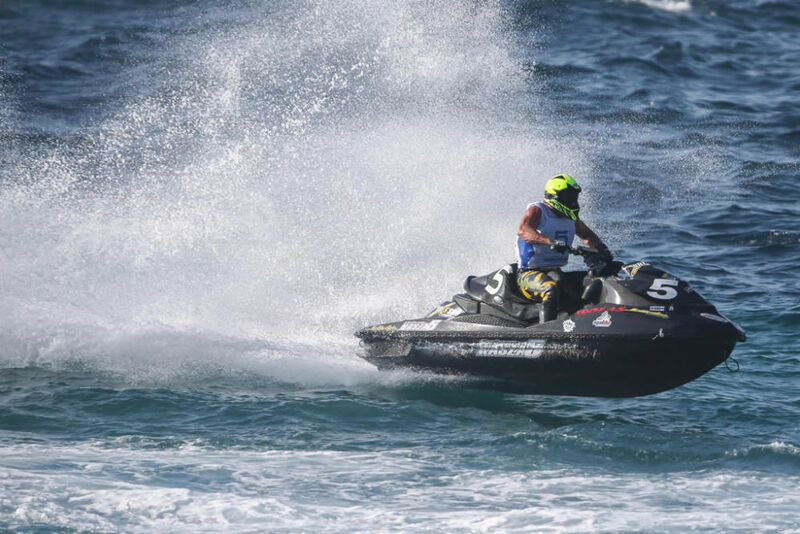 Saturday, 26 May, GALLIPOLI (Italy): Kevin Reiterer celebrated his maiden outing in the UIM-ABP Aquabike World Championship for the Dubai based Victory Team with a comfortable victory in Ski GP 1 in the opening Moto of the year at the UIM-ABP Grand Prix of Italy. Second place went to France’s Raphael Maurin with Belgium’s defending champion Quinten Bossche coming home in third to complete a Kawasaki lock-out of the top three positions. 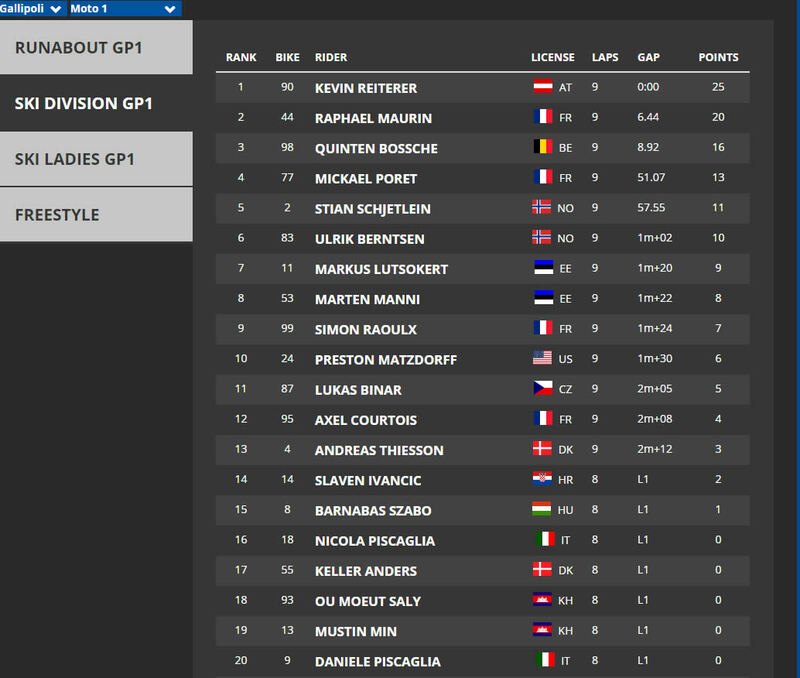 Maurin lost a place early on after qualifying in second but was able to regain the slot on lap 3 after passing Poret but was unable to make any impact on the run away race leader. Pole-sitter Bossche was the big loser at the start but fought his way back to take third, with Poret producing an impressive performance to be the first non-Kawasaki rider to take the chequered flag, bringing his Bullett V3 home in fourth. Stian Schjetlein picked up a place to finish fifth ahead of Norwegian countryman Ulrik Berntsen. The defending world champion produced a flawless virtuoso performance leaving her rivals in her wake to take her 18th moto win and the chequered flag by a winning margin of 45.66s. Latvia’s Krista Uzare lost out from starting in pole dropping to third but recovered to finish in second, with young Sophie Borgstrom producing a sensational performance to take her best result on the UIM-ABP tour finishing in third to complete a Swedish one-three. The testing conditions took their toll at the start with newcomer Jessica Chavanne dropping her bike immediately from third place off the beach with Borgstrom stunning the 13-strong field, moving from the outside of the line from 12th place to lead at the end of the start lap from of Ortendahl, Uzare and Italy’s Marta Sorrentino. 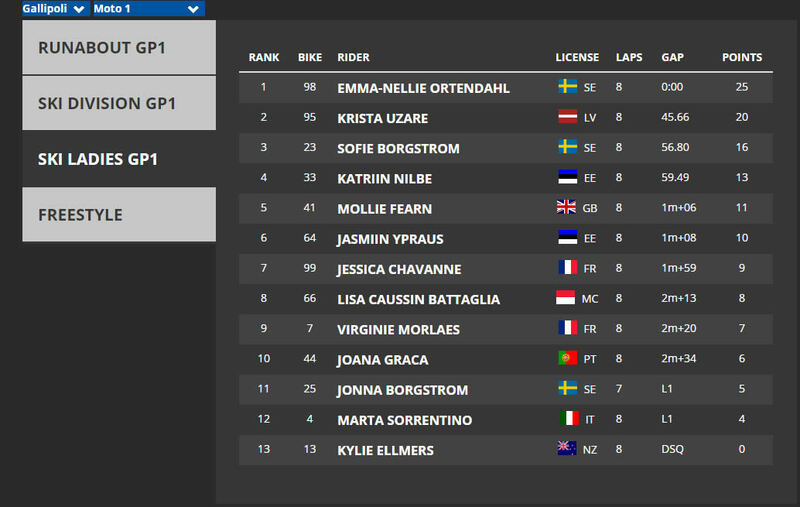 Borgstrom’s lead was short-lived and she was passed by Ortendahl a lap later then slipping to third when Uzare went by her on lap 3. After hitting the front Ortendahl disappeared into the distance stretching her lead over Uzare to 17 seconds on lap 3 and was 40 seconds clear starting the penultimate lap. 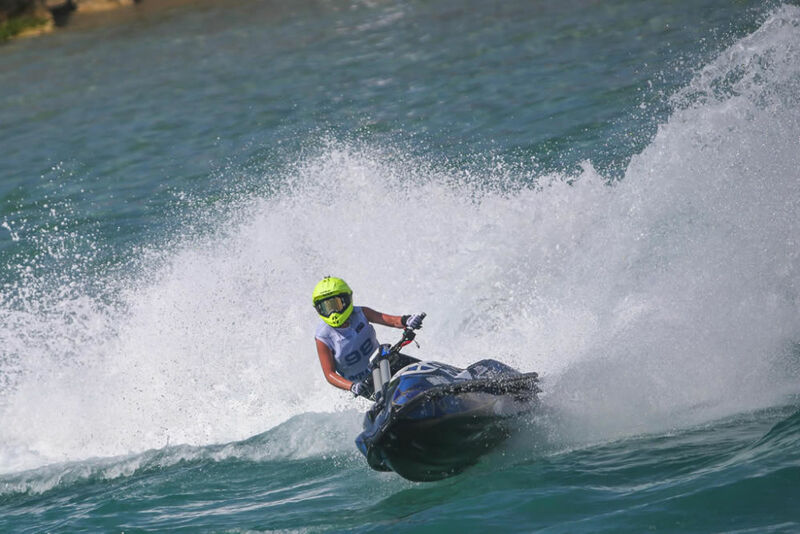 Uzare finished comfortably in second to match her best result in the championship with Borgstrom coming under pressure and brilliantly holding off a strong and repeated challenge from Estonia’s Katrin Nilbe, Britain’s Mollie Fearn signalling her arrival on the UIM-ABP tour finishing in fifth ahead of tour newcomer from Estonia Yasmiin Ypraus. No word as yet from Kylie Ellmers on the disqualification incident but she’ll be fired up for moto 2 thats for sure.